Medical Clowns – In a program organized by Kedma, volunteers are trained as medical clowns to go into Jerusalem hospitals and bring cheer to sick children, distracting them during medical treatments, and aiding the medical staff in caring for these children. Several training sessions will prepare volunteers for their work as medical clowns. Ezrat Avot: (Located in Meah Shearim) o Tutoring program: Volunteers will provide one-on-one tutoring and homework help for children from homes with financial or emotional difficulties. Volunteers will also engage in occasional Arts and Crafts or holiday activities with the children. o Cooking for the homebound elderly: Volunteers will cook and package nutritious meals for homebound elderly. Aleh – Volunteers will assist in a school for children with acute special needs. Located in Romema (near the Central Bus Station). Shalva – Volunteers will assist in an afternoon program for children with special needs. Located in Har Nof. Chayeinu (Chai Lifeline) – Volunteers will assist families with children suffering from critical illnesses. Volunteers will first meet the families in the hospital and then maintain a relationship with one specific family (either in the hospital or in their homes). One Family – Volunteers will aid families that have been victims of terrorist attacks. Volunteers will assist with the children at home, in many cases helping the children with their schoolwork. 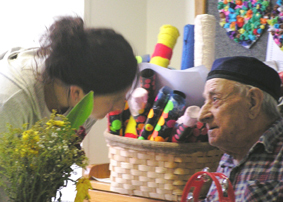 Beit Tovei Ha’ir – Assisted living facility for elderly in Geulah. Volunteers will interact one-onone with specific residents. Machshava Tova – Volunteers will assist individuals (new olim, Ethiopians, underprivileged youths) at a free computer center. Basic knowledge of computers necessary. organization, or ??? office work for a ,"????? ????? " Miscellaneous – Volunteer for a family that is help package food at Yad Eliezer, and on and on and on. Unfortunately, there are many, many chesed opportunities in Jerusalem.